Your custom molded dash cover will arrive in an unpainted, black color if ordered without paint. The Dash Cover can easily be painted in any color that you need, so that you can custom match your current vehicle interior. We recommend using a high quality paint that will withstand the heat and sunlight, as well as any movement that might occur. We recommend using SEM brand Color Coat paints for a quality, lasting finish. If you need SEM Aerosol Spray paint, we sell it by the can. Click Here! Before painting your new dash cover, we recommend dry fitting the part to the correct place in your car. This will verify that the correct part was shipped, as well as to allow you to make any minor adjustments such as sanding. In addition to selecting the correct paint, we recommend that you NOT use a primer when painting your new dash cover. For the best results, we recommend cleaning the surface of the dash cover with Windex to prepare the surface of the plastic to be painted. Please make sure that the plastic is completely clean and dry before painting. Any dirt, dust, lint or moisture on the surface of the dash cover will prevent the paint from adhearing to the surface and will affect the finish when the paint dries. You should spray the new dash cover with 3 light coats of paint. The first 2 coats will be streaky, but the third coat will come out even. Be Careful to only use light coats. If you are too close, the paint will clump and run. If you are not familiar or comfortable with painting your new Dash Cover, please contact a professional in your area to paint it for you. Dry-fit the Dashboard cover: Fit the dash cover in place to make sure you got the correct item. Make sure it fits properly and the glove box opens. Paint your new dash cover: Paint the dashboard cover, or have it professionally painted for you. See above for details on painting your new dash cover. Warm up the Adhesive: Place the tube of silicone adhesive that came with your dash cover in a glass of warm water. This will soften it and make it flow easier. Fix high spots on the original dashboard: Use a utility knife to trim any raised areas on the original dashboard as needed in order for the dash cover to fit as close as possible. Be careful to only trim those areas that will be covered by the dash cover. Prepare the surface: Clean the original dashboard and the underside of the new dash cover with alcohol or Windex. All waxes and oils must be removed from both surfaces in order to get the best adhesion. Rough up both surfaces with sandpaper to get the best adhesion. Apply the adhesive: Apply the adhesive to the underside of the dash cover around the perimeters of the air vents and the entire outer edge only. The adhesive bead should be about the size of a pencil and about 1/2" away from the edge. 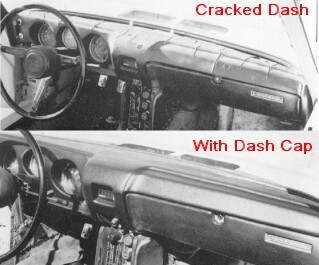 Install the dash cover: Place the dashboard cover over the original dash. Push carefully and evenly in order to seat the dash cap and spread the adhesive evenly, near the edges only. Replace the accessories: Replace the pans, grills and accessories that were removed previously. Clean up. Wipe up any excess adhesive with a damp cloth. Secure in position: Use rolls of paper, cardboard wedges, elastic cords and weights to hold the dashboard cover firmly in place. Allow at least 4 hours for the adhesive to set and cure. Unclamp and clean: When the adhesive has set and cured, remove the securing items and peal away any excess adhesive that is showing. Maintenance: Mild car care products such as Windex or soap and water can be used to clean your dashboard cover.